This week we head to Montana, also known as Big Sky Country, and the home of director David Lynch, Hollywood cowboy Gary Cooper, and the man who made the phrase “March Madness” famous, sportscaster Brent Musburger. Nestled among the beautiful mountain vistas of Butte, Montana is a lake one mile long, half a mile wide, and nearly 1800 feet deep. 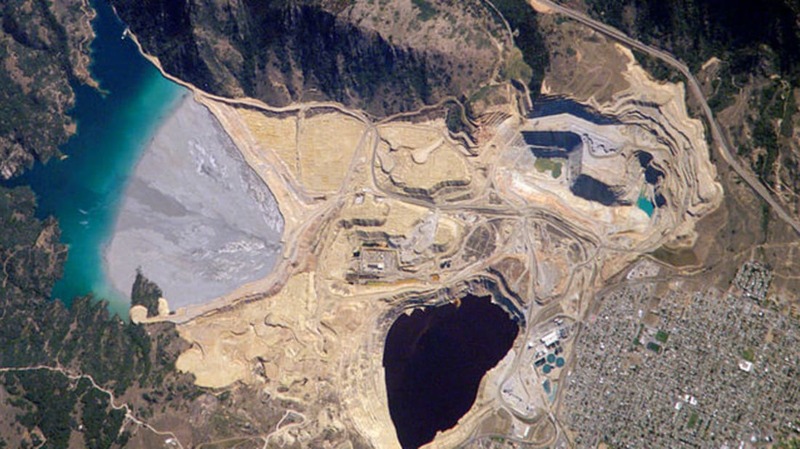 Although many people visit the Berkeley Pit every year, no one swims or goes water skiing, because the lake is a toxic stew of heavy metals and chemicals such as copper, arsenic, cadmium, and sulfuric acid. The Berkeley Pit was a copper mine from 1955 until 1982, when low metal prices forced the owner, Atlantic Richfield Company (ARCO), to shut the site down. Shortly after, the pumps that kept groundwater and rain from flooding the pit were turned off, allowing the water to rise at the rate of about one foot per month, bringing residual metals with it. The rate has slowed over the years to about six inches per month, but if left unchecked, the Environmental Protection Agency (EPA) estimates that the water from the Pit will reach a critical level—approximately 5410 feet above sea level—that could contaminate groundwater sources for surrounding communities. To illustrate how disastrous this could be, in 1995, a flock of migratory snow geese landed in the Pit to rest during a storm. A few days later, the bodies of 342 birds were found floating on the surface of the lake. The initial body count was 149, but it was later changed after it was discovered that many of the snow-white birds had turned orange-brown after being exposed to the lake. ARCO insisted that the lake had nothing to do with the birds’ death, citing a study conducted on their behalf by Colorado State University, which showed the birds they sampled died from a fungus growing on grain that they must have ingested. The State of Montana did their own analysis and found the birds’ throats and stomachs were burned and covered in sores, believed to have been caused by the high levels of toxins in the water. Today, employees at the Pit do hourly spot checks during migration periods to look for birds that are staying in the water for more than 4 to 6 hours. If the birds overstay their welcome, they are run off by noises ranging from firecrackers to speakers that emit sounds similar to those made by predators. Although the Berkeley Pit is not a very hospitable place for plants, fish, birds, or even insects, the lake is not completely void of life. Researchers have discovered various forms of extremophile algae that are able to survive in the toxic sludge. There is hope that these organisms, as well as a water treatment plant built on the site in 2003, will help reduce the dangerously high levels of pollutants in the water before it reaches a critical level. As of March 2014, the lake sits at 5315 feet above sea level, and current EPA projections estimate it will reach its 5410 foot breaking point in 2023. In the meantime, you can visit the Berkeley Pit for a mere $2 and buy a souvenir of the country’s most toxic lake at the nearby gift shop.